Every artist or collector has a different idea of what plein air painting is, with some being more encompassing, and others less so. And hopefully, without falling into the trap of trying to tell you what Art is – or isn't – here are my own thoughts on the matter. Literally, en plein air (fr.) means to go out and paint in open air. I know this may come across as redundant in English, but this is the basic definition, it's important, and many folks seem to miss it. The primary reason a landscape artist opts to paint en plein air is because they have come to appreciate the real world is far more complex than anything else their mind can construct. This is not to claim that plein air is the highest form of art, the painter's über-aesthetic, but rather to suggest that if an artist enjoys constant stimulation, a variety of subject matter, and terrifying challenges, then the plein air world can offer all that. In spades. Some artists call it color. Some call it revealing the shape or planes. Some artists go a little woo-woo lay claim to painting the air. Or, that they are drinking deeply from the vérité of the moment. (I like that last one!) Whatever the outdoor painter might say, it works for me so long as he or she is being attentive to the light. For it is the light we cannot bring back indoors! I don't now about you, but I can usually tell when a painter hasn't been looking at the light, or has chosen to ignore it, and if they have I am left puzzled as to why they bothered to come outside at all. So, as long as the 'plein air' painter is paying attention to the light, and investing it into the painting, then whatever else they may be doing fits within my quixotic definition. I don't care if an artist is practicing hard-core realism, loose impressionism, wild-*ssed crazy expressionism, or working in whale-blubber – so long as the light can be found in the work it is plein air . . .
You may well notice when reading through these definitions that they don't agree. French term meaning out of doors. Refers to practice of painting entire finished picture out of doors as opposed to simply making preparatory studies or sketches. Pioneered by Constable in Britain c.1813-17, then from c.1860 became fundamental to Impressionism. Important technical approach in development of Naturalism. Subsequently became extremely widespread and part of practice ofRural Naturalists for example. Sometimes taken to extremes e.g. by Stanhope Forbes of whom there exists a photograph of him painting on a beach in high wind with canvas and easel secured by guy ropes. Typically, painting a picture in the open air requires rapid composition and brushwork, neither of which is feasible unless the artist is familiar with the fundamentals of drawing. 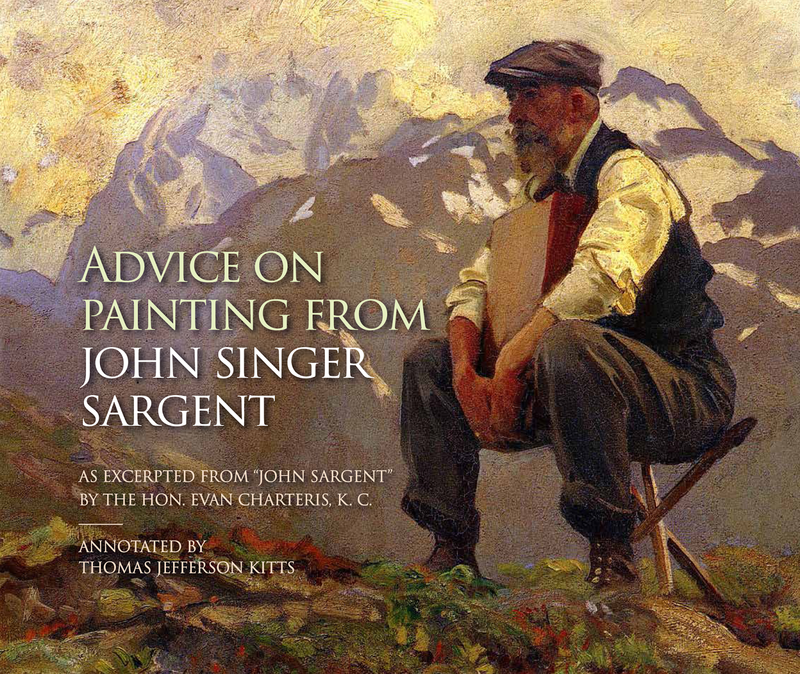 Thus it is no surprise to learn that many, if not most, outdoor painters were academically trained in life-drawing and perspective. En plein air (French pronunciation: [ɑ̃ plɛˈnɛʁ]) is a French expression which means "in the open air", and is particularly used to describe the act of painting outdoors. A painting that gives the feeling of being outdoors. The Impressionists tried actively to convey the open air feeling in their work. The term is also used to describe landscapes that have been painted outdoors. Plein Air - A painting done outside rather than in a studio. The term comes from the French en plein air, meaning 'in the open air'. Pronounced As: en-plan-âr, Fr. en-plen-er [Fr.,=in-open-air],term used for paintings or drawings made directly from nature and infused with a feeling of the open air. Painting outdoors is a relatively recent practice; the impressionists and the painters of the Barbizon school made plein-air painting an important dimension of their landscape work. Plein air is French term meaning outdoors / in the open air. Painting plein air is essentially about observing and painting subjects from life outdoors. This practice increased in popularity in the nineteenth century after the invention of tubes for oil paint. 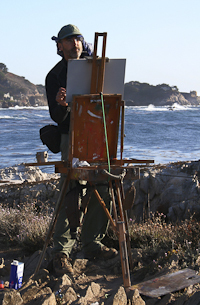 Plein air painters can paint in any media and usually paint landscapes. They typically attempt to capture the impression of the atmospheric effects in terms of light and colour as these cannot be recorded by a camera. Some painters who paint plein air will always finish what they start outdoors; while others (such as Monet in later years) are content to start a painting plein air, make a record of the light and colour and bring it back to the studio for completion. What's your definition? I'll publish the best ones in a linked post. The definition that we use as criteria for inclusion in our NHPleinAir Artists group shows is "All paintings should be AT LEAST 75% completed on site, with only minor detail and finishing done in studio. " 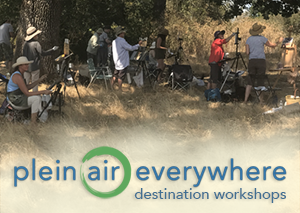 We consider plein air painting to be that in which the artist is immersed in nature, not looking through a window at nature, but also where the artist is painting the subject matter before him/her (as opposed to taking one's easel outside and working from a photograph of a different location). Paintings may be finished in one sitting (ala prima) or on return trips to the same location. Using a video loop of a scene while in studio is definitely not plein air work. As a group we agreed on the 75% completion standard, allowing for the fact that sometimes highlights need to be enhance and/or small details like fence posts may need to be added with a small brush in studio. We've found that using time to determine the %age is easy for folks to calculate - eg if it took an hour to do the painting, no more than 15 minutes allowed for those in studio touch-ups, and the painting shouldn't be altered by more than 25%. Thanks, Plein Air Gal. Your group certainly has established a clear definition of plein air painting. Do people really take a photograph and paint from it from a different location outside? That's just crazy . . .